My brother Innes is away in Cambridge for a year and was wanting a wee video tour of the new hen house and chicken run, so I thought I’d share it with everyone here too! No more chickens around the house! My run is finally complete and I will no longer have the hassle of chickens loose around the back of the house, pooing everywhere! My new hen house has been ready for a few weeks, and the hens have been using it, but they keep coming down to the house during the day. Not any more. 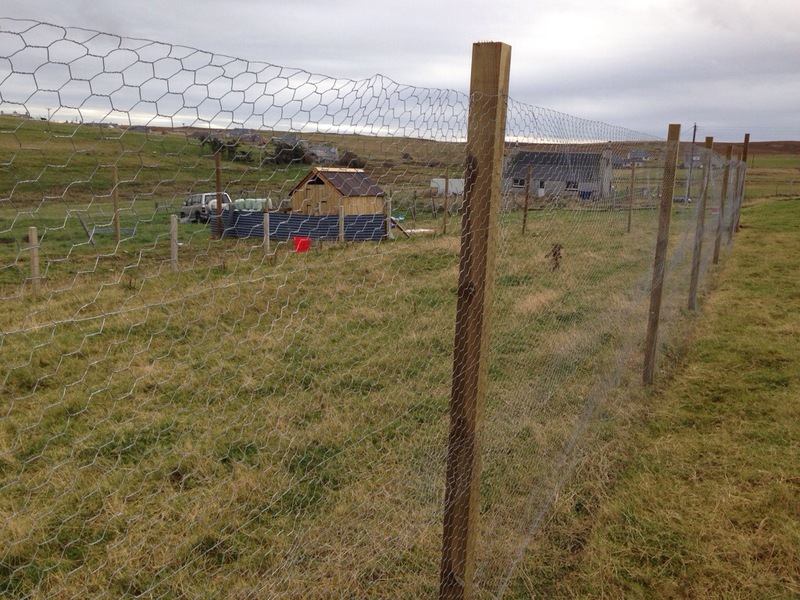 I started putting the fence posts up 2 weeks ago but needed someone else’s help to put up the fencing itself. My father was available today, so we got cracking at 9am. We had the fence up by 11. I’m pretty happy with how it is, but we needed to do some odd jobs around the run, making sure the chickens couldn’t get out (no predators here, so that’s not a concern). 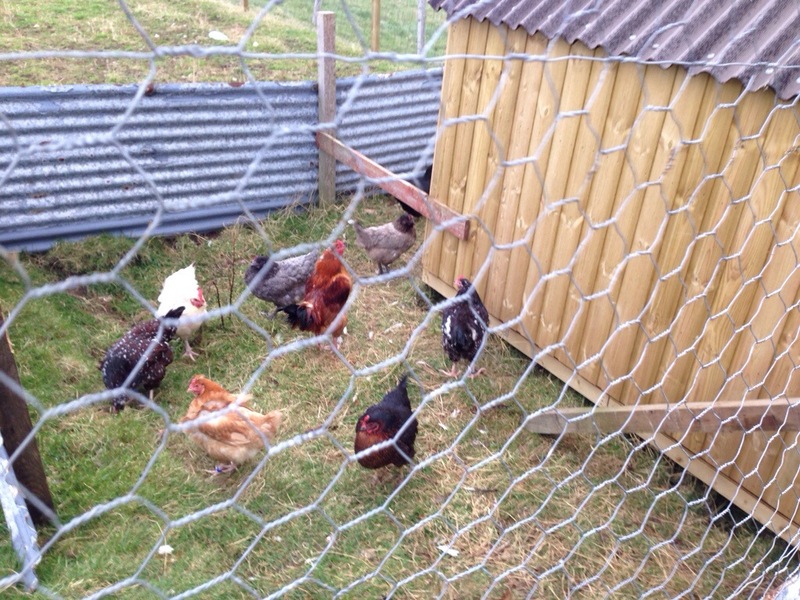 That took a couple of hours in the afternoon and then we rounded up all 44 chickens and got them into the run. They seemed to like it! I will keep it under 50 hens, as you have to register if you have more than that. I’m hoping I’ll have a few eggs to welcome me tomorrow morning. Fingers crossed. 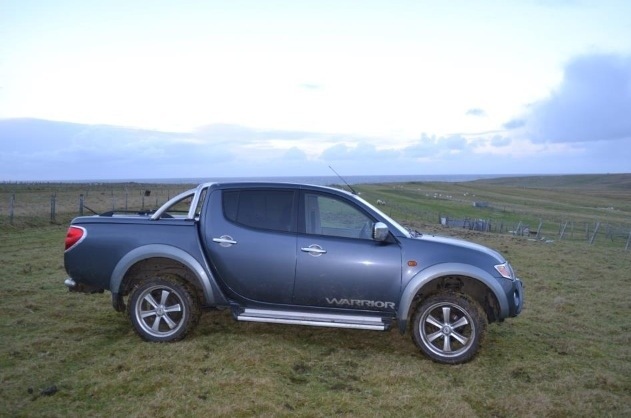 There are a couple of boys on the croft who have been waiting impatiently for this day – and it’s finally come. I got my sheep ready yesterday and let the boys out to do their thing today. First of all, I had to pick up the new ram that I had agreed to buy. I popped down to the other end of Ness for him. 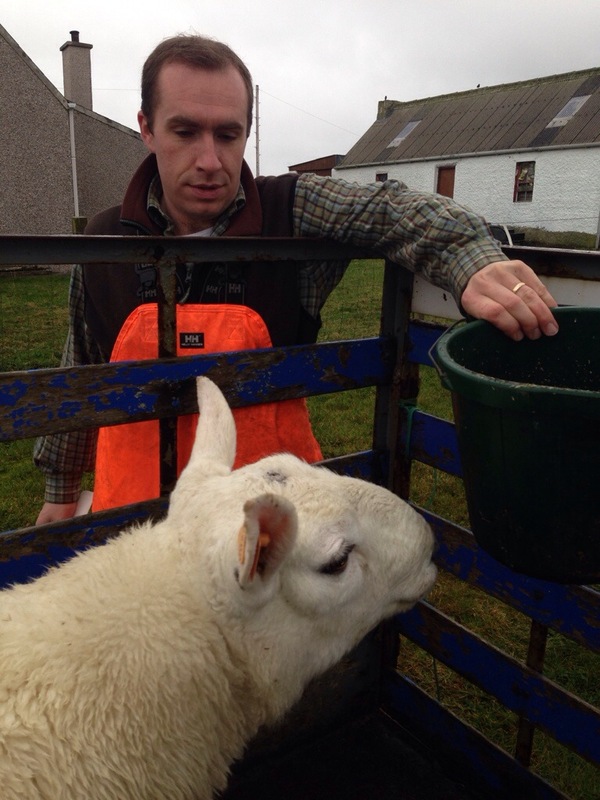 Here he is with Duncan Mackinnon, former Traditional winner at the Mòd and stockman for the people I’m buying him from. I took him home, drenched him and fitted him with his lingerie! 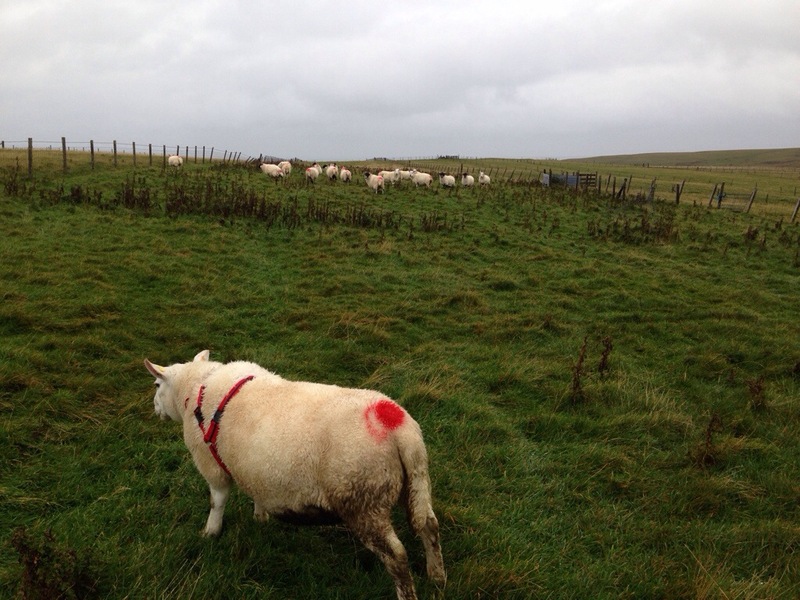 A harness which holds a paint block, which then marks the sheep that the ram had served. This lets me know that a) the ram is doing his thing and b) when each sheep has been served. 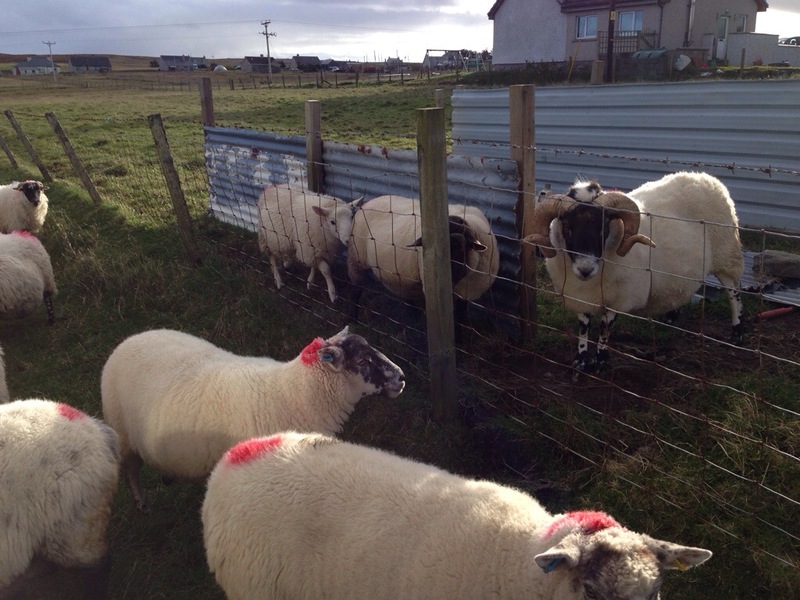 I then let him loose with the ewes, didn’t take him long to introduce himself! 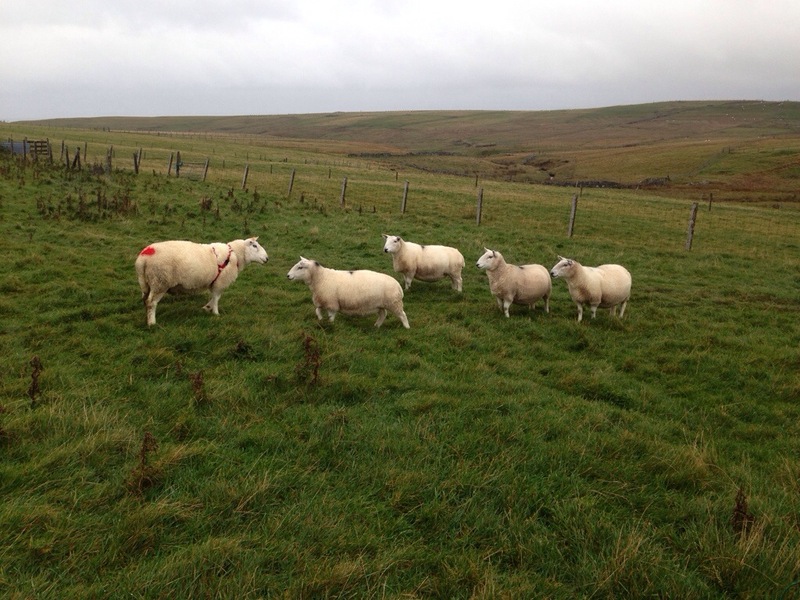 That’s the Cheviot out, the Suffolk was also let loose with his half of the animals. Now all I have to do is wait! This morning was stressful. I’d been informed that I had been chosen for a ‘count’ of my sheep. Basically an audit of my animals and my records. The animals weren’t an issue, but the records were! 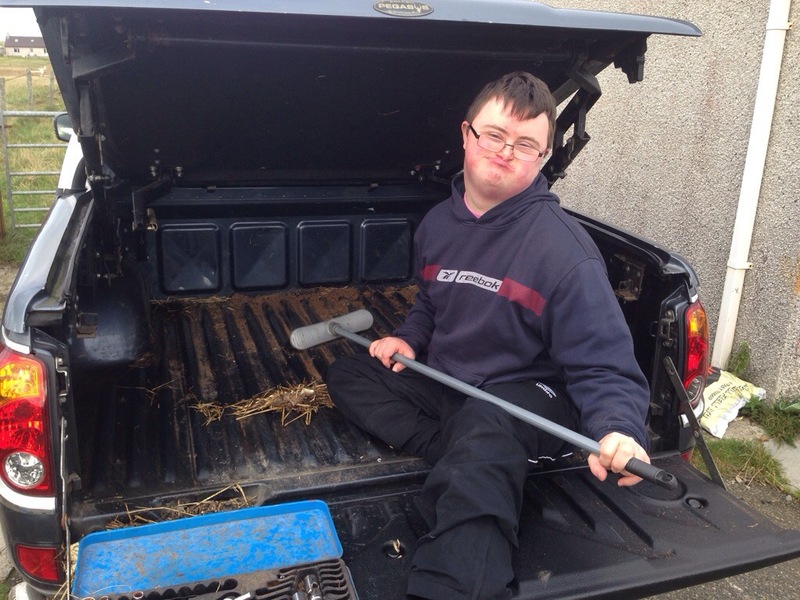 I was up and at ’em and out at the sheep at 7am today, getting everything ready for 9.30. Of course things don’t go to plan when you’re under pressure! 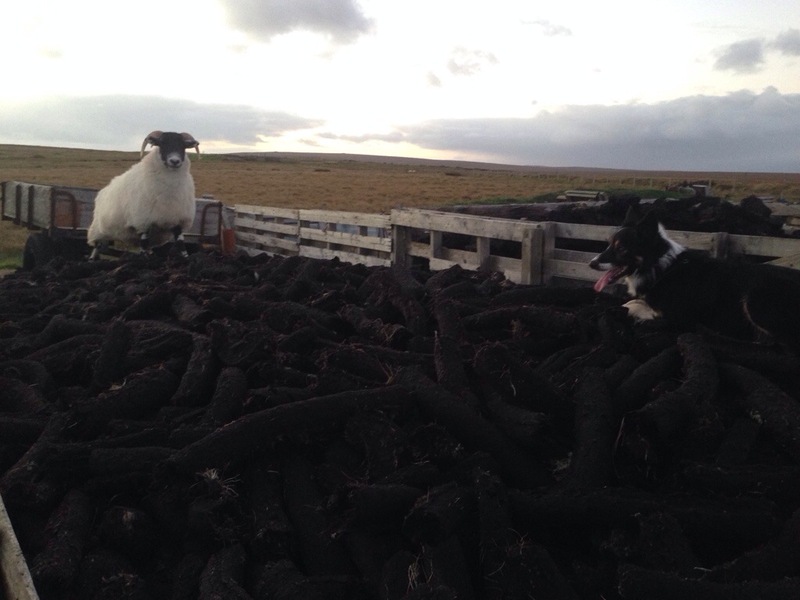 A couple of sheep broke away and ended up behind someone’s house, with one of them facing-off with Bud on top of a peat-stack! didn’t take long to get them all penned and then we sat down to go through the records. It took around 2.5 hours in total, most of it at the kitchen table, and around 30 mins checking all the tags in the sheep. 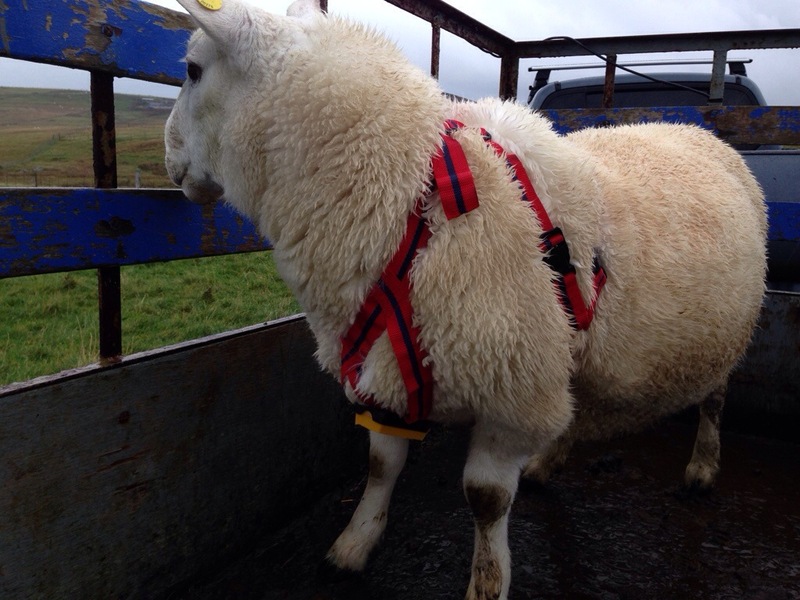 It took a while to go through them all, right back to when electronic tagging began in 2010. Let’s just say I know have a MUCH better idea of what I should be recording. I’m just glad to get through it without too much hassle. 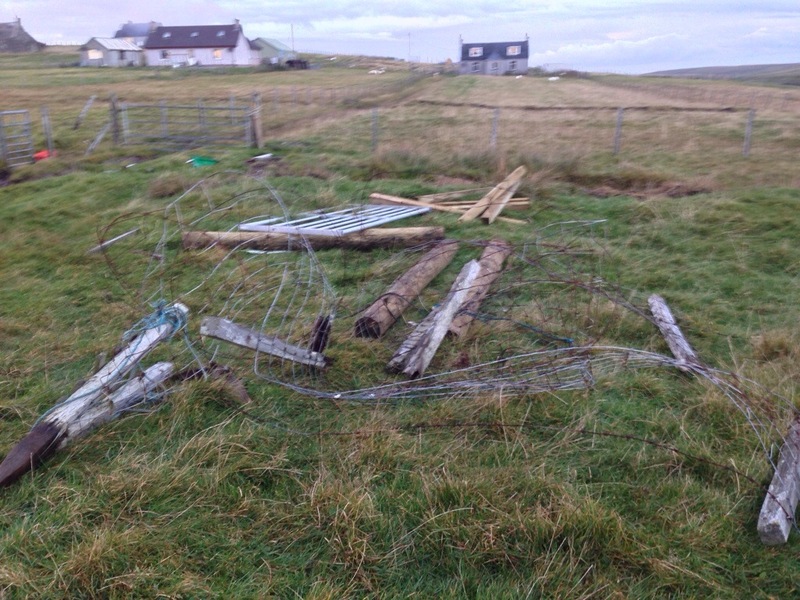 Seeing as I had all the sheep in the fank, I decided to do some work. 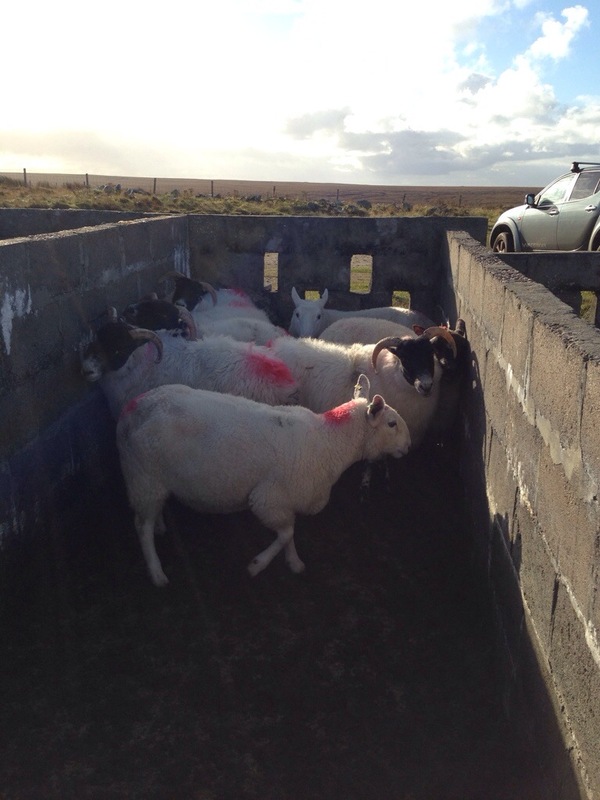 I am using 2 rams this year, on nearly 50 ewes, so I split up the ewes, depending on which ram they were going to. 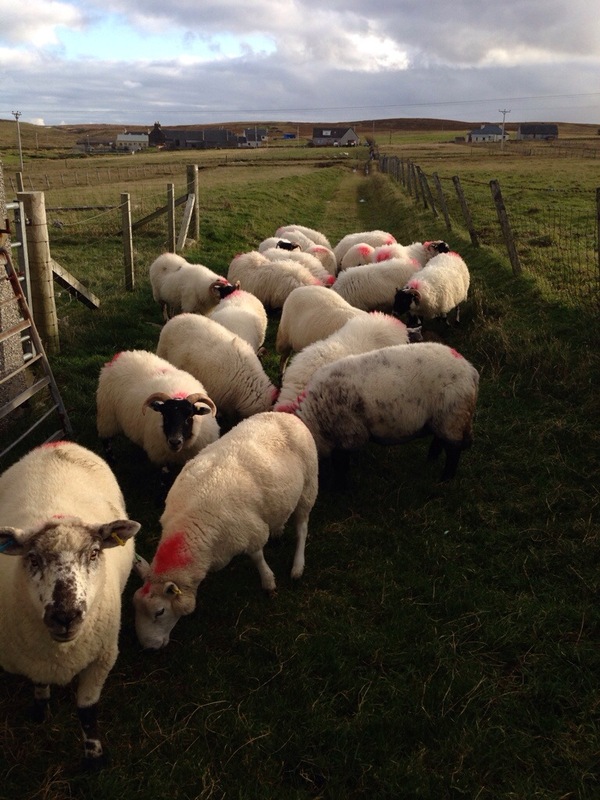 They’re all back on the croft now, ready for the rams to be let loose. The sheep are waiting and the rams are keen! If they’re lucky, them might get out tomorrow. 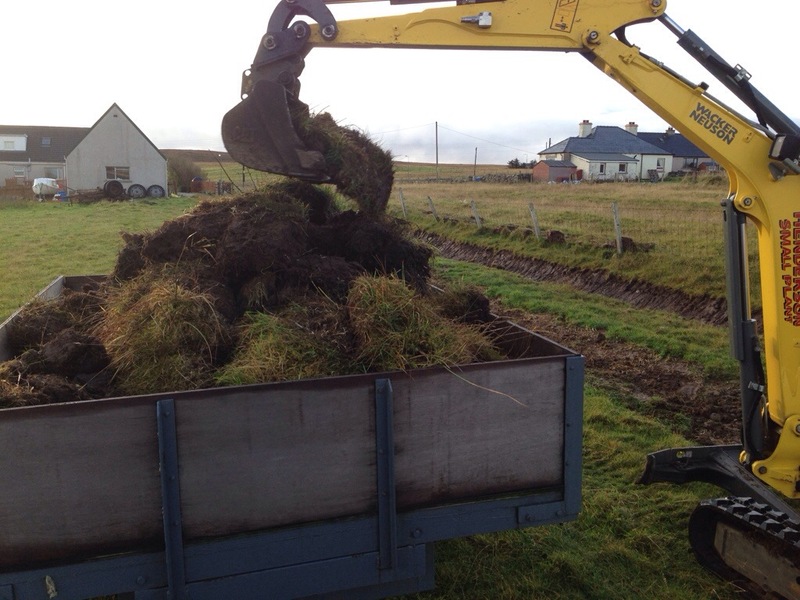 This time last year, I put in an application for drainage on the crofts. This week, it was finally finished and I will put my claim form in on Monday. 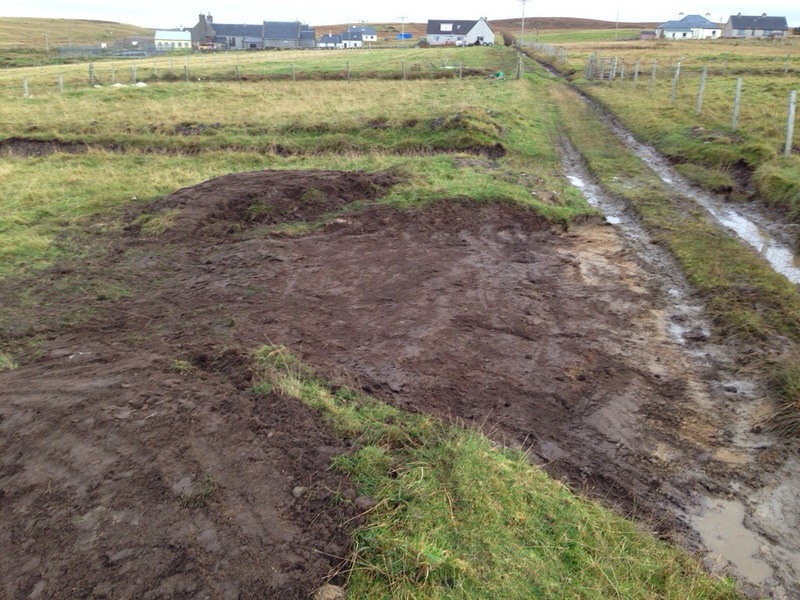 The drainage on my croft is costing £189. I get 60% back, meaning it costs me £75. 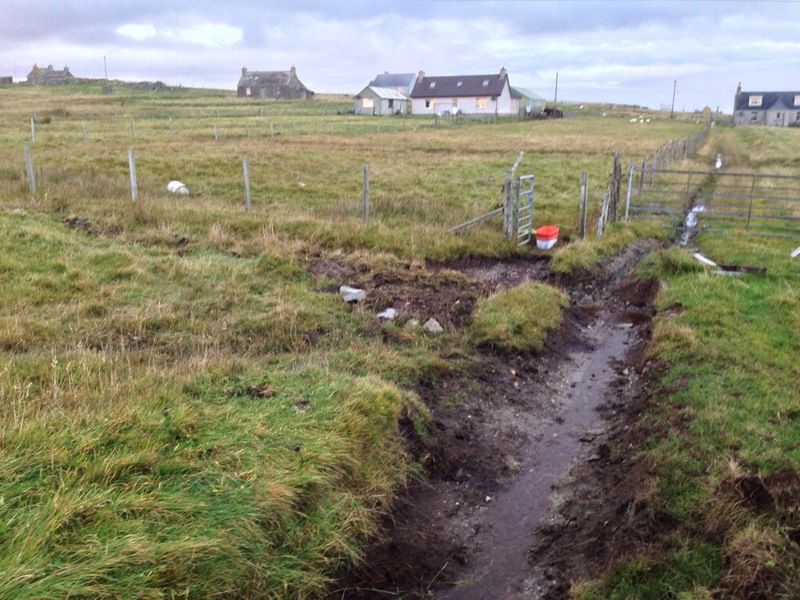 My mother’s croft had twice as much drainage dug and she only gets 50% back. John Angie Henderson, of Peateater fame, was the contractor used. 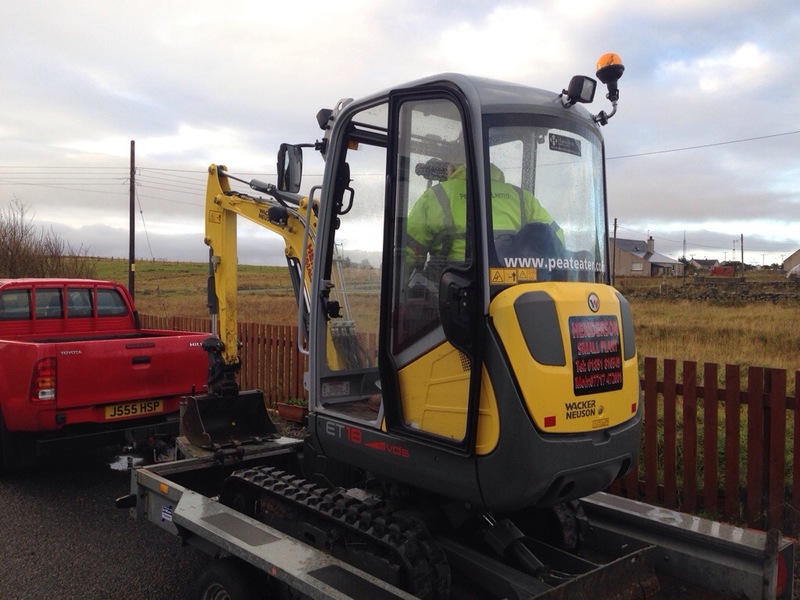 He had done all the drainage work a couple of months ago, but came back to tidy up some of the material that had to be carted off site. 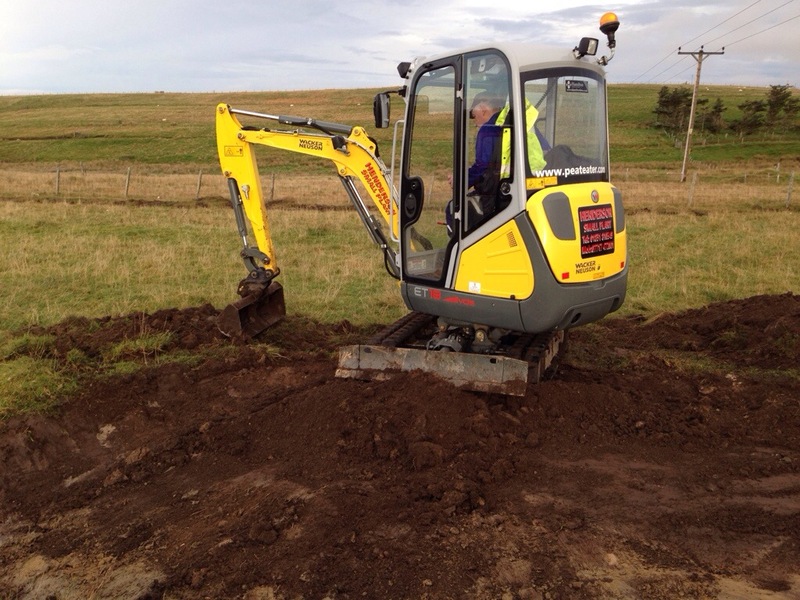 There was no where on either croft suitable for dumping the material that came out of the big long ditch, so I moved it to another site. I quite enjoyed my day in the tractor, running back and forth with the earth. Beats working in an office anyway and a productive way to spend my week’s holiday. The only other thing we did was make a wee bit of access for the tractor, to allow me to get somewhere that was a little tricky before. 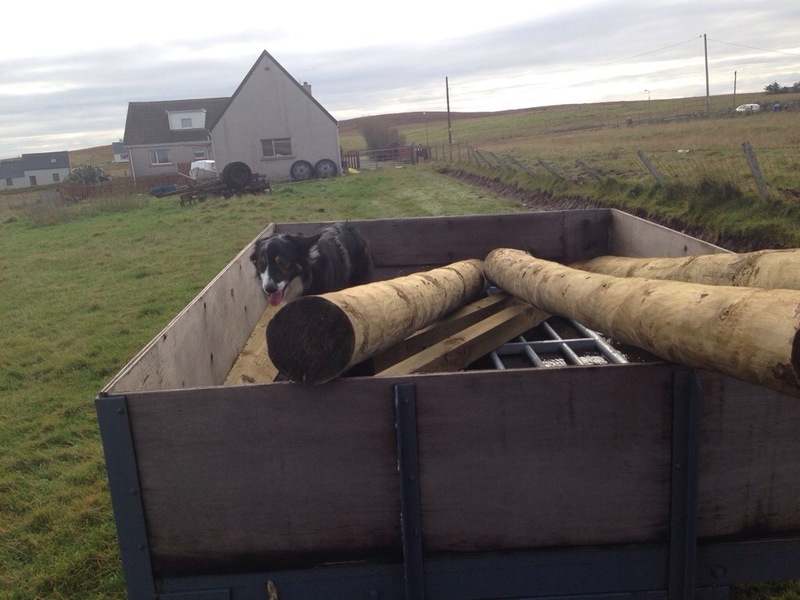 I had a great afternoon today, pulling down some old fencing and getting the new posts etc ready. 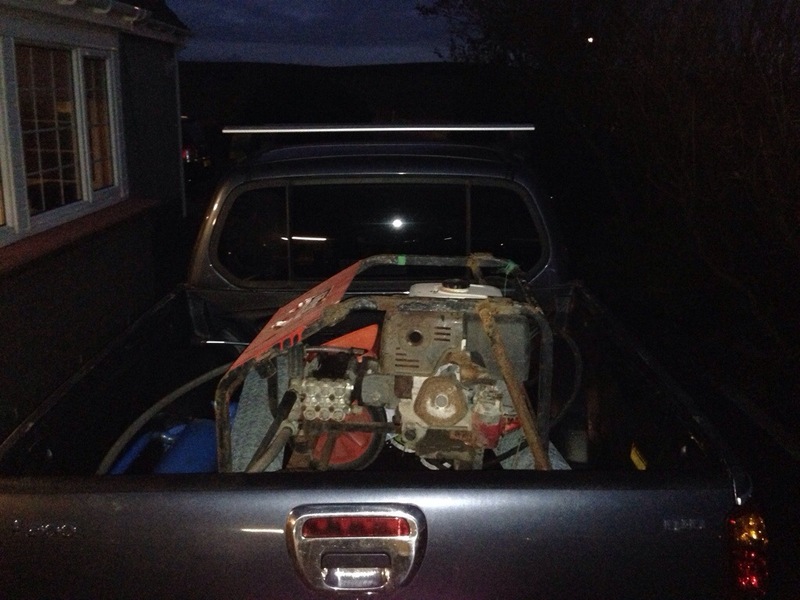 I recently had some ditches dug/cleaned out across both crofts and tomorrow I’m going to have some fun carting away some of the earth that was dug out. I actually cannot wait! 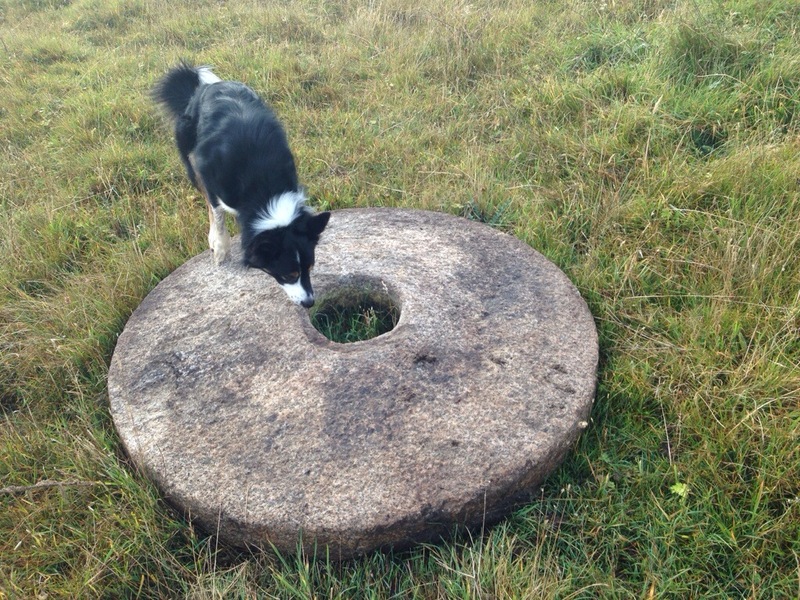 In this picture, Bud is sniffing a mill stone that was sunk into my croft, but had to be moved to allow the digger to access. Originally a millstone, then used by a blacksmith to make wheels. Any suggestions on how I could use it? I’m on holiday all week and staying at home, so expect lots of posts! 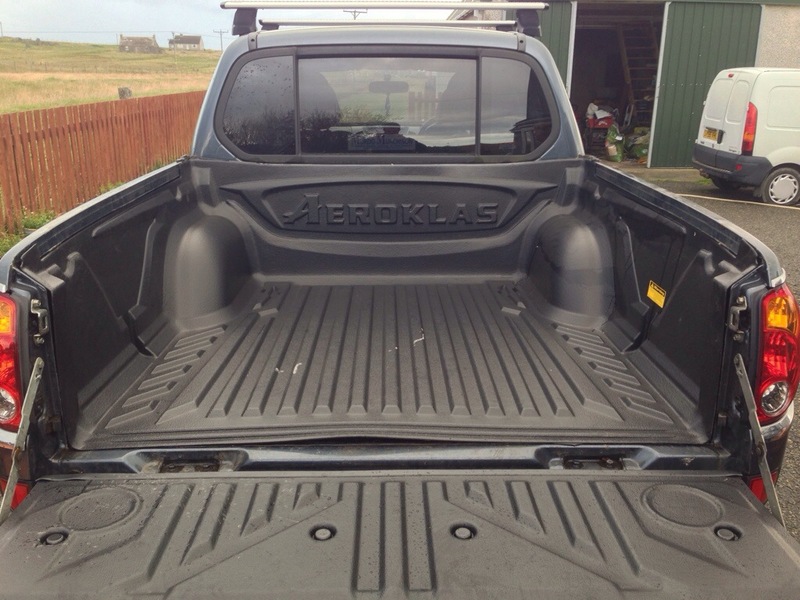 I’ve had a £200 load-liner for my pickup sitting in the barn for 6 months and decided that it was about time I fitted it! I went out my parent’s house to do it, as all the tools are in the barn. First thing was to clean the interior, which Martin helped me do (I bribed him with lunch). 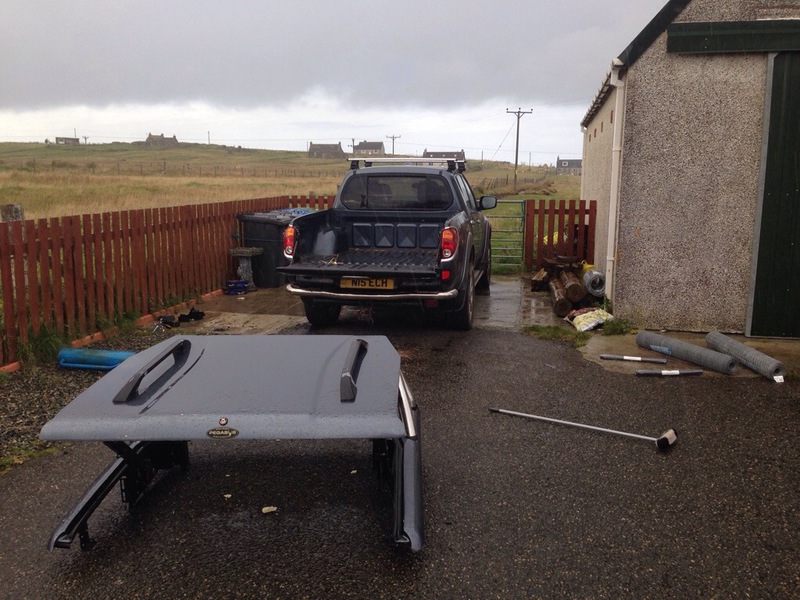 The hardest part was removing the flat-top that was fitted. Took me about an hour. Not easy to lift off on your own either! 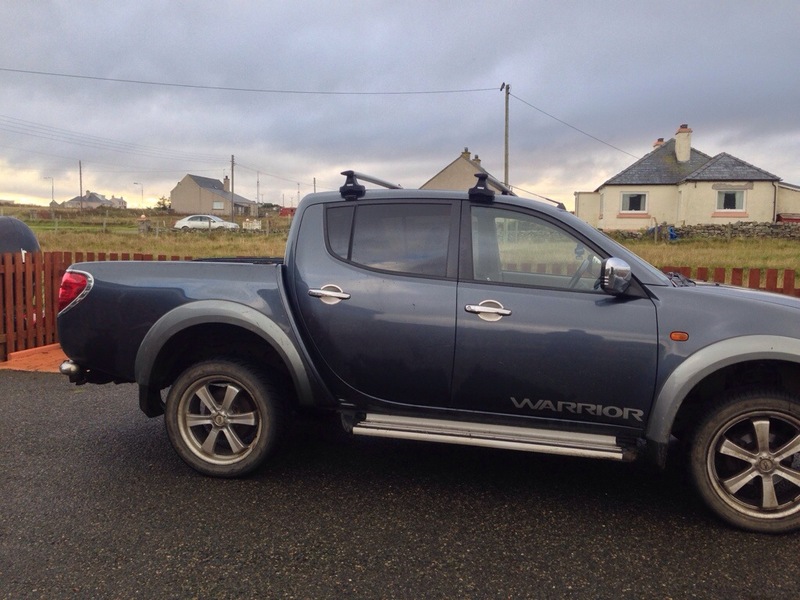 The load liner was then fitted in a couple of minutes. Ta-da! Now I have a decision to make; do I put the flat-top back on? Right now, I don’t think so. It’s not practical enough for me. Here is before and after, does it affect aesthetics of he pickup? It’s definitely not going back on this week, as I have lots of stuff to move about. It’s already been put to good use, with the power-washer there just now.